St Stephen’s belongs to the Church of England, and we want to share with our neighbourhood our experience of a God who both comforts and challenges his people. We believe in a loving creator God, that Jesus of Nazareth was God in human form, and that the Holy Spirit of God is active in the world today. We aim to worship in a way that is free and informal, and yet serious and relevant, using modern translations of the Bible and a mixture of traditional and newer songs. 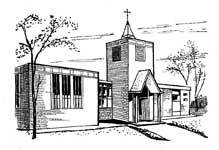 Our services are mostly Holy Communion, at 10 a.m. on Sundays and Wednesdays. We also have a network of home groups, where we help one another to understand the Bible and apply it to our lives. YOU are welcome, whatever your background and whatever is happening in your life at the moment.